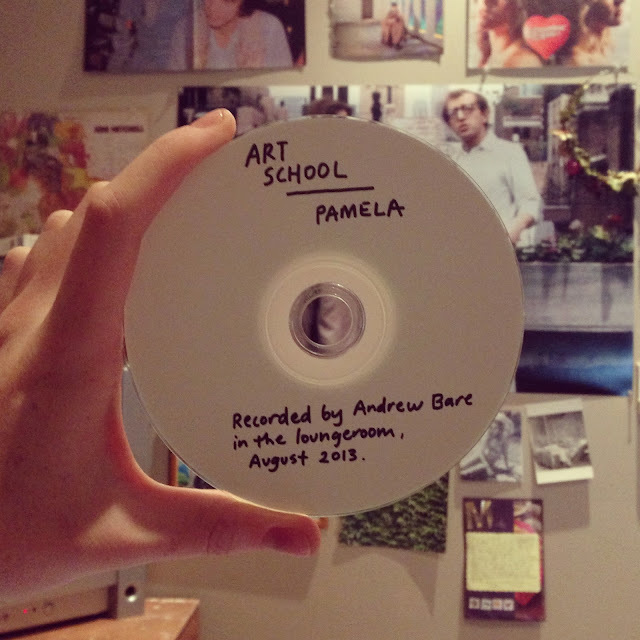 Tomorrow morning Pamela's song Art School is going to be played on the radio station Triple RRR. It will be included in a segment called SmartArts that starts around 9.30am. The recording just came back to us yesterday after we recorded last week at Jon's place. It sounds absolutely brilliant and I am so proud to be able to say that I wrote a song! Well, I wrote the lyrics. Jon Campbell wrote the melody :) I wrote half a song! Go me! So, I'm excited for that to premiere over the airwaves. I'm trying to upload it to Soundcloud so that our 'fans' (ha ha) can listen to it whenever they want! But it's not working for me wah. I will make my sister help me and then I will tell you when it is up! It's a really unique song in my *humble* opinion, because my Mum said it sounded like something out of a '70s sitcom - I get that because it sounds really melancholy (Georgie's description) but a bit soft pop like Belle and Sebastian (Jon's description). We're all singing so seriously and I love that because the lyrics are so funny and not serious. Can you imagine if it really was the theme song to a sitcom! That would be one crazy show. The trials and tribulations of art school and the relationships within.. dum dum dum! Also, the wonderful writer Alicia Eler (who wrote one of my catalogue essays for my show at Daine Singer) mentioned and quoted me in an article she wrote on Hyperallergic called This is Not an Art Selfie. I was so excited about this! I love a good selfie and they have helped 'be my mirror' (NICO anyone) now and as a teen-agerrrrr. I love using them to document moments, feelings etc that would otherwise in my mind be transitory. I look back on past selfies and get sentimental. They also allow you to project and set yourself up as something/someone specific. They allow you to curate the self. I like that. I didn't actually even take a selfie today so don't have that note to finish on... sorry. Work tomorrow, all day I'll be stressing that I have nothing to wear to all the fancy events I have coming up next week. Is it okay to be legitimately worried about what I'm going to wear? Is that shallow and superficial? Does it even matter if it is?